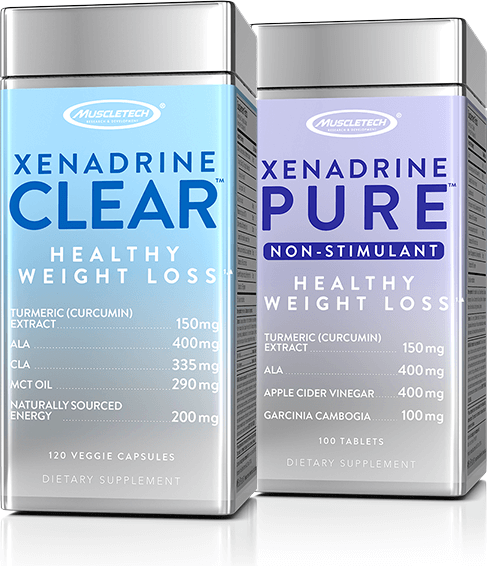 Now you have even more options for weight loss!1 The double patented combination of ALA and Turmeric Curcumin can be found in both Xenadrine Clear and non-stimulant Xenadrine Pure. You can interchange these two supplements to fit your lifestyle. 1Average weight loss in two 16-week studies on ALA + curcumin was 12.56 and 4.84 lbs. All subjects followed a calorie-reduced diet and walking program. You can interchange Xenadrine Clear and Xenadrine Pure. 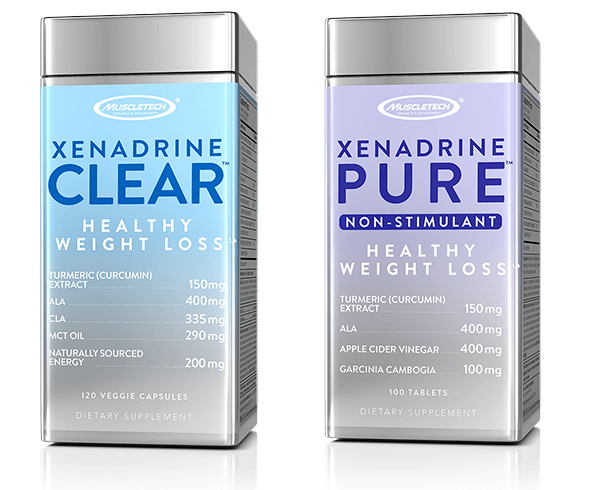 While Xenadrine Clear contains naturally sourced caffeine for an added energy boost, Xenadrine Pure is a non-stimulant. From effective weight loss to increasing your energy, these supplements are sure to help you seek the body you want when added to your active, healthy lifestyle. We recommend taking Clear during the day and Pure in the evening. Pure has no stimulating ingredients, which makes it the perfect choice for taking before dinner. Keep your progress going with these two amazing choices! TURMERIC (CURCUMIN) EXTRACT - From the Indian spice turmeric, standardized to 95% curcuminoids. ALA - A compound found in every cell of the body that turns glucose into energy and helps metabolize carbohydrates, protein and fats. CLA - Derived from pure safflower seed oil. MCT OIL - A rapidly absorbed energy source, supporting a ketogenic diet. NATURALLY SOURCED ENERGY - Enhances energy, thermogenesis, and focus with caffeine. BIOPRENE BLACK PEPPER EXTRACT - A patented extract from black pepper fruit. Just Pay S& for the first 30 days, then $69.99/month until you cancel. Cancel anytime. APPLE CIDER VINEGAR - Created by fermenting apples. GARCINIA CAMBOGIA - Standardized to 60% hydroxycitric acid. 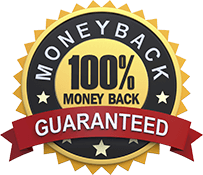 Try It Free Just Pay S& for the first 30 days, then $69.99/month until you cancel. Cancel anytime. 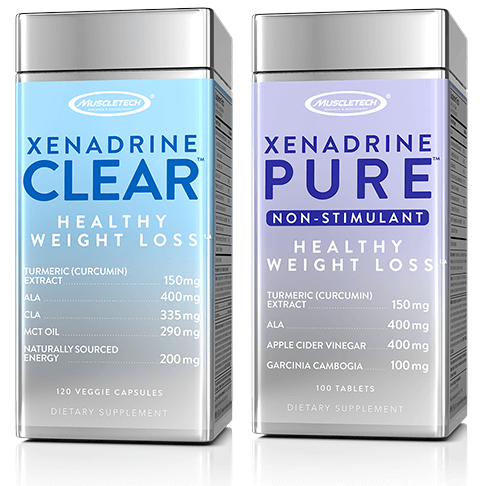 Xenadrine Clear contains an innovative key ingredient combination for an added edge in your healthy weight loss plan. ALA, a compound that helps metabolize carbohydrates, protein and fats, and curcumin, which is found in the Indian spice turmeric, are two ingredients that make the Clear life such an obvious choice. Why? Thanks to two scientific studies, it was discovered that when curcumin and ALA were combined, participants saw significant weight loss results. Don’t wait any longer! You can start living the Clear life today with this limited-time Free Trial offer!